Summertime is here and now that the kids are out of school, many families are planning vacations and spending more off time with their children. Make sure to make fishing part of that time spent together; few activities offer the one on one quiet time together that fishing does. Even heading down to the local community pond to tackle some feisty Bluegills and chasing frogs is often a special time for children and parents alike. Rising water temperatures in the upper bay are starting to move fish into a typical summer pattern of seeking out deeper and cooler water. Water temperatures are close to 80-degrees in many areas of the upper bay and fishermen are beginning to see the best fishing in the lower Susquehanna during power generation water releases at the Conowingo Dam. The influx of cooler water tends to spur fish such as Striped Bass into feeding. Most fishermen are casting swim shads and crankbaits in the river but soft plastic jigs can also be a good bet. Fishermen report there are still plenty of White Perch in the Susquehanna and other major tidal rivers in the upper bay as well as the reefs and knolls between Rock Hall and Baltimore Harbor. Most fishermen are using bottom rigs baited with pieces of bloodworm for White Perch fishing. Trolling for Striped Bass in the upper bay has been good this week along some of the steeper channel edges such as Love Point and around Sandy Point Light. Chumming is a viable option and most days will see boats laying out chum slicks at Swan and Love Points and to a lesser degree Podickory Point. If one can gather up some live spot that puts a fisherman’s luck and success rate in an entirely different category. Any steep channel edge that is holding Striped Bass is a good bet as well as structure such as the bay bridge piers, rock piles or the sewer pipe on the northeast side of the bridge span. The bay waters are still cool enough that casting a variety of lures along shoreline structure around locations such as Pooles Island and Baltimore Harbor can offer some fun fishing in the early morning or late evening hours. Jigging soft plastics over suspended fish near channel edges or similar structure is also a good option in the upper bay. The area below the Bay Bridge continues to hold a wonderful grade of Striped Bass this week. Traditional locations such as the outside edge of Hackett’s Bar, the Hill, Thomas Point, Clay Banks and similar channel drop off edges have all been excellent places to catch Striped Bass this week up to 30″ in length. The action is pretty hot south to some grey area below the False Channel and Breezy Point; below there the action tends to taper off and fishermen report that there are hardly any Striped Bass outside of the Gas Docks. Live lining Spot is the most popular way to catch one’s Striped Bass and fortunately the Spot are plentiful in the shallower areas of the middle and lower bay regions. Bluefish have yet to show up yet so this is a happy time for live liners. Trolling is a good way to catch Striped Bass this week and small to medium sized spoons such as Tony and Crippled Alewife spoons tend to lead the way in the better catch success, followed by chartreuse bucktails. The reports are that deeper is better so most fishermen are employing inline weights to get presentations down to where the fish are holding. 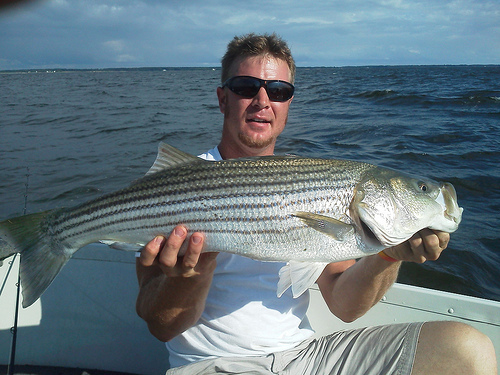 Chumming is still a good option for fishermen and locations such as Thomas Point, Buoy 72 and the channel edges in the lower Potomac have been popular places to successfully chum up some Striped Bass. Jigging over suspended fish near channel edges continues to be a successful way to catch Striped Bass on light tackle and many of the channel edges all over the middle bay region have been producing good results. 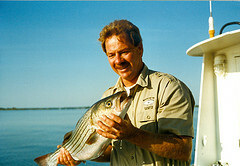 Jay Yesker was jigging in Eastern Bay when he caught this nice Striped Bass. The early morning and evening shallow water fishing for a mix of Striped Bass and Speckled Trout continues to be good this week during periods of good tidal flow with a high tide being the best. The success rate on Speckled Trout really picks up south of the Choptank River as does the chance of catching a red drum within the 18″ to 27″ slot size. Most fishermen are casting a variety of swim shads and topwater lures but the white Gulp Mullet tends to stand out for the Speckled Trout and Red Drum. Some enterprising fishermen have been live lining Spot in some of the fast moving guts and channel areas in the eastern lower bay region and catching some bragging size Speckled Trout or as they are called down south, “Gator Trout”. Bottom fishing for a mix of croaker, Spot and White Perch has been good in the middle and lower bay regions. Most of the best action is taking place in the lower sections of the tidal rivers in the channel areas. Baits such as peeler crab, squid, bloodworms and shrimp have been popular baits. Fishermen are reporting there are lots of croakers to be caught but unfortunately many are 9″ or less and 10″ to 13″ seems to be the most common “keeper” size; once and a while fishermen are treated to a 17″ croaker which of course invokes memories of years past when we all enjoyed those large croakers. A few flounder are showing up along hard channel edges around Point Lookout and the Tangier Sound area and Speckled Trout can also be part of the mix. Recreational crabbers are reporting fair to good crabbing in the middle and lower regions of the bay and most often success tends to lean more towards fair. Crabbers are reporting a lot of crabs that are missing the legal mark by less than an inch and it would appear that those folks purchasing crabs for the Fourth of July will see Number One crabs measuring at 5-1/2″. Recreational crabbers will be allowed to crab on July 3rd which is a Wednesday this year. 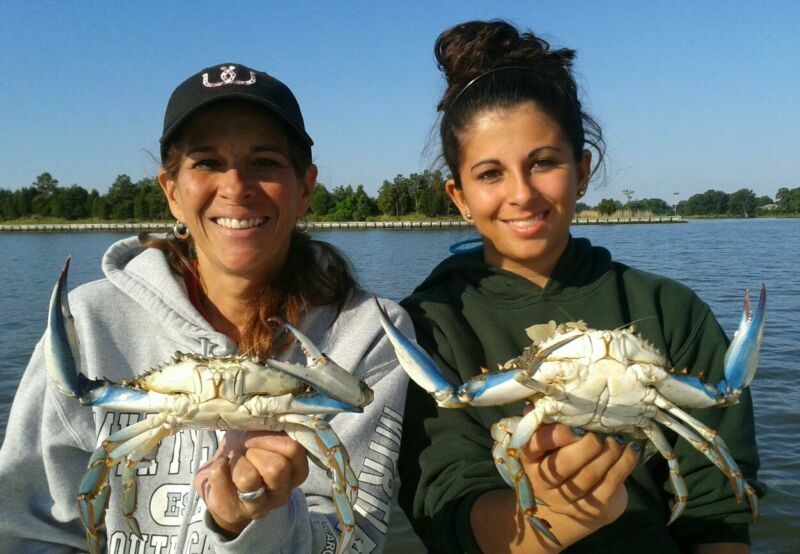 Rich Watts took his wife and daughter out crabbing recently in the Miles River and reported a lot of 5″ to 51/2″ crabs which they threw back and held out for a couple dozen jumbo sized beauties such as these being held up for the camera. Freshwater fishermen in the western region are enjoying good fishing for Smallmouth Bass in Deep Creek Lake and the upper Potomac River this week. Most fishermen are casting tubes and crankbaits with good success. They do report that most of the Smallmouth Bass are in the 14″ size range but there is plenty of action. Largemouth Bass present good fishing opportunities in Deep Creek Lake and other lakes and ponds within the region and let us not forget the feisty Bluegill Sunfish. Trout fishing in the trout management areas can offer some wonderful fly fishing opportunities this time of the year with various dry flies and terrestrial flies. In the Central and southern regions of the state Largemouth Bass tend to dominate the fishing scene this time of the year. The bass are starting to move into a summer pattern of behavior and the early morning and late evening hours tend to offer some of the better fishing. 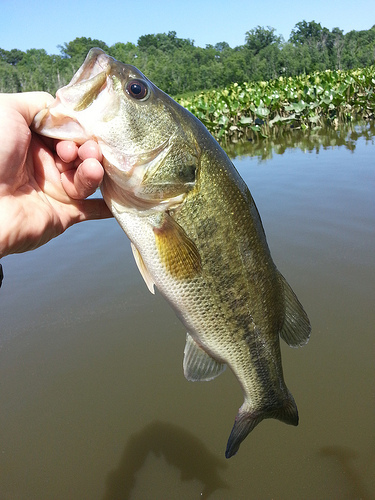 Bass are orienting to thick grass and similar structure now looking for shade, docks are always a popular location to flip soft plastics as are fallen tree tops. Buzzbaits, chatterbaits, frogs and poppers are popular lures to work over grass for Largemouth Bass. Trevor Tufty sent in this nice picture of a Largemouth Bass he caught on a Senko in the tidal Potomac. Fishermen in the tidal Potomac and its tributaries may also find snakeheads attacking baits. There is a big snakehead tournament at Smallwood State Park this weekend with speakers such as tidal bass manager Dr. Joseph Love form the Maryland Fisheries Service and Joshua Newhard from the U.S.F&W.S. There will also be snakehead cooking demonstrations and plenty of good laughs, for more information check out WWW.Potomacsnakehead.Com. Ocean City area fishermen are settling into the summer months now and surf fishermen are catching a mix of Kingfish, croakers, Spot and small Bluefish. For those fishermen looking for a little more pull there are Blacktip Sharks, dogfish and sting rays on larger baits. In and around the inlet fishermen are finding flounder and Tautog during the day and a few Striped Bass and Bluefish at night. The tog are being caught on fresh sand fleas and it should not be too long before Sheepshead begin to be caught. The Striped Bass and Bluefish are being caught on swim shads and live spot. In the back bay areas there are flounder in the channels along with blowfish, croakers, Spot, small sea bass and Cow-Nosed Rays. Offshore the boats fishing the reefs and wrecks for sea bass are doing well with double digit catches being common. A few big flounder are being also caught near the wreck sites. Out along the 30-Fathom Line fishermen are finding large Bluefish and a few small Mako Sharks. In the canyons Yellowfin Tuna are being caught and they range from throwbacks to 75lbs. Fishermen are now starting to do some deep drop fishing in the canyons and are bringing back tilefish to the Ocean City docks. Keith Lockwood has been writing the Fishing Report since 2003 and has had a long career as a fisheries research biologist since 1973. Over the course of his career he has studied estuarine fishery populations, ocean species, and over a decade long study of bioaccumulation of chemicals in aquatic species in New Jersey. Upon moving to Oxford on the eastern shore of Maryland; research endeavors focused on a variety of catch and release studies as well as other fisheries related research at the Cooperative Oxford Laboratory. Education and outreach to the fishing public has always been an important component to the mission of these studies. Keith is an avid outdoorsman enjoying hunting, fishing, bird dogs, family and life on the eastern shore of Maryland.